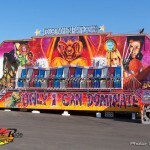 The showman’s family was surprised with the success of this ride and soon manufactured a Miami of their own. The Kroon family later went on to form the Dutch-based KMG Manufacturing, now a highly respected manufacturer in the world ride industry. Other manufacturers soon latched on to KMG’s success to make their own Miami’s. These include UK based: Nottingham UK Ltd, KT Enterprises, and ARM (producing only 2 units, now based in USA under Chance), Belgium-based manufacturer Sobema [no longer in business], US manufacturer Wisdom and a number also manufactured in the Czech Republic. The Miami is highly compact single trailer ride with minimal set-up & tear-down time – they practically fold themselves up. The ride movement is essentially a high speed Rainbow with alternating clockwise / counter-clockwise movement of varied speeds. While the swing height is nothing in comparison to the Rainbow, the Miami makes up for its modest size with quick accelerating rotations. 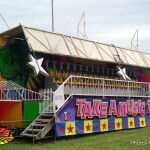 Due to the high negative g-forces experienced at the top of rotation i.e.. the rider is lifted from their seat, all Miami’s have over-shoulder safety restraints. These quick accelerating movements are assisted by counter weights on each arm, which in all models except Wisdom’s, are located behind the backdrop. Miami’s have a high reputation when it comes to art since each Miami has its own large backdrop of artistic flare. Some of the best examples are in the UK painted by Paul Wright. I LOVE THE MIAMI RIDES!! 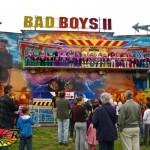 I have been on one called the La Bamba.I live in Carnoustie and theres a carnival that comes once or twice a year.I was wondering is there another carnival coming with a miami??? Thanks.. I love miamis there is so many over here now mainly notts uk ones and a few emmett ones.i worked on the very first kmg ride that came into the uk which was called miami back in eary 1990. I went on one called the Ali Baba and it was shaped like a flying carpet. i was nine the first time. 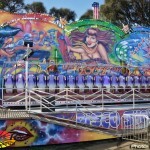 it was the funnest ride of the carnival. 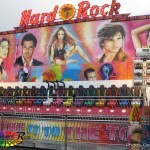 ther was also a role over miami built, the cars wear like the cars fownd on the zipper, in a big line along the bote. 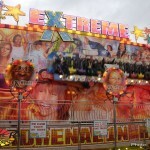 The ride was converted to a standard one soon after beacus it didnt work very well. 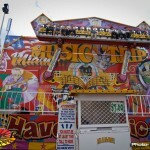 The website for the Miami rides needs to be updated… could not find any photos or a gallery of the rides on the site mentioned there. We have something like this in the US in Wisconsin called the Gee Whiz. It’s got awesome strobe lights for night. Our carnival is tonight so I’m gonna have a blast! Going on the Gee Whiz first! This model was the old Crazy Surf @ the Santa Cruz Beach Boardwalk. I love Miamis! 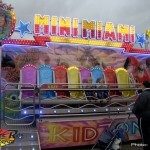 So far, I’ve only been on two different Miamis in my life, those being the Miami Wave at Butlins Skegness and Roger Tuby’s Disco Fever at Spalding fair, but I’m hoping to ride more Miamis soon. 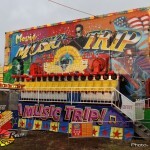 I’m planning to ride Charlie Appleton’s High Energy at King’s Lynn mart, Miami Trip at Rainbow Park in Hunstanton, Dance Zone at Luna Park in Scarborough, and Miami Fever at Bayside Pleasure Park in Bridlington. I’ve been ridden on the miami ride once, and I think it has been one of the most wonderful experience. A miami ride is really fun!